So it's been a few days about 2 weeks, since I've blogged, and it was such an unfortunate post to share about LO's new furniture. Ugh. Even now if I stop and dwell on it I just get mad all over again. Some of you have wondered what our final decision was, and I'll tell you that we have chosen to ((gulp)) keep the furniture. I know, I know... Most of me was against this idea from the moment we unboxed it, and to be honest, I REALLY REALLY REALLY don't feel like we got our money's worth on this purchase, even after they refunded a paltry amount in an attempt to appease us. But it's done now, and I'm choosing to move forward. We have requested they replace the arched mirror in its entirety, and are awaiting its arrival, so at least we can assume that one will be in better condition (hopefully, anyway). Hubs spent some time caulking all of the trim on the headboard and footboard, and I have to say it looks simply amazing. Exactly like what I would've expected it to look like brand new, straight out of the box. All that's left now is for him to caulk the trim around the individual drawers on the double dresser, and I anticipate that will look just as awesome. So really, at the end of the day, this is the lesser of two evils, especially considering I didn't have a Plan B of alternative furniture that I was set on. Some exciting news? The big room makeover is taking place in T-Minus 2 days!! Actually, less than that! I'll be getting started after LO heads to school Friday morning, and we'll have all day Friday and Saturday until early evening to get it all done. I couldn't be more excited! I am SO ready for this and I cannot wait to see LO's shock & awe response when she sees it all for the first time. She has no idea this is happening (nor that she'll have a fun sleepover with the grandparents while it takes place! ), which makes it that much more fun for me! Be prepared, because I'm pretty sure I'll have the amazing Before & After post ready to share on Sunday (or Monday at the latest). WOO-HOO!!! Oh, and after 3 different paint samples, I've finally settled on Ballerina Gown by Behr. It's a very pale pink, so hopefully once all the walls are done it won't look like Pepto-Bismol threw up everywhere. I'm finding that the online sample has some weird purplish hue to it, but I can promise you it's really just a very very pale pink. Another random piece of excitement? I needed a new breast pump for baby #3 because we sold the one I used with LO and Chase on craigslist back in 2010. That's pretty exciting news, right?? No? Oh, well let me continue... I've shopped around and the Medela Pump in Style that I want runs around $299.99. Ouch! So I've been trolling eBay recently to see if I could land an amazing deal on a NEW, UNUSED, UNOPENED, SEALED pump (as I'm totally not willing to purchase one that's been opened or -- heaven forbid, used -- from a stranger off the interwebs). There have been a few I've watched come and go and they typically land around $190 or so at best. Well, friends, let me just tell you that I am pleased to announce I just landed said $299.99 breast pump for... wait for it... $152.50!!! Seriously. I am beyond thrilled!!! I can't wait for it to arrive so I can investigate and verify it truly is still factory sealed and unused so I can be super happy with my score. Woot! On a less than happy note... last Saturday hubs and I went to a wedding and ran some errands while my mom stayed with the kiddos. We were on our way home when I got a call from my mom, saying, "Don't be surprised if you see fire trucks in front of the house when you get here." My first question was whether or not the kids were okay. Of course I was super freaked out that something happened to Chase. She assured me she and the kids were fine, but that there was a FIRE IN OUR BACKYARD. Luckily we were less than 2 minutes from home when she called, and we actually saw the fire truck pull into our subdivision as we were about to turn in. We found my mom with the kids in the front yard while half our neighborhood was in the backyard, apparently having just put out a brush fire with a dozen or so garden hoses from neighboring homes. There wasn't much for the firefighters to do but assess the area and be sure the fire was fully out. Whoa. I just took these pics this morning so it's had a good 4 days of improvement from what we originally saw Sunday morning once the smoke cleared. ;) Hubs tells me some people purposefully burn up their grass to help it grow in better. So yay, apparently this isn't horribly detrimental to the grass. 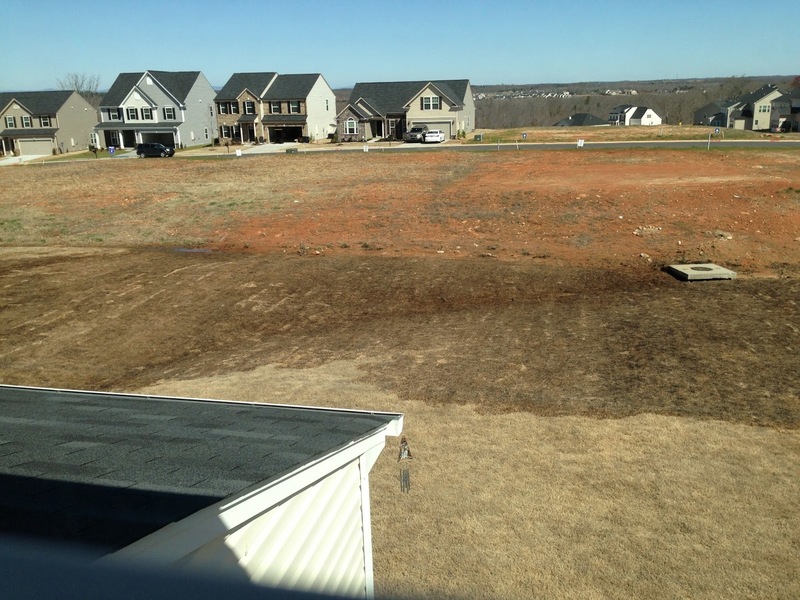 My biggest issue is that whether the grass grows in better or worse in the burnt area, it's going to grow in differently than the rest of the yard. Those of you who know me well know that I'm OCD about things like this and enjoy consistency. 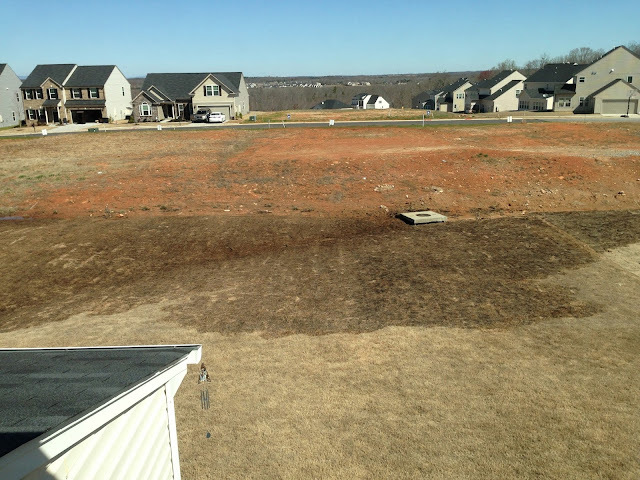 So I'm super crazy bummed that the fully-sodded yard we paid good money for will most likely grow in completely different in the two areas. Grrrrrr! But it doesn't sound like there's much we can do about it, so whatevs. I've chosen to keep my window blinds in the morning room closed so I don't have to look at it because honestly, it looks horrible in person and when I see it, it just makes me crazy disappointed. So I'm choosing to ignore it for the next 2-4 months until the dormant season is over and we can see what kind of growth we will end up with. I'm not looking forward to this, but will keep my fingers crossed that it's not horribly obvious. Ultimately I'm just so thankful that all that was damaged was the grass... no one in the neighborhood was hurt and none of the homes were damaged. It could've been MUCH worse... it was crazy windy that night. But thanks to the quick actions of the neighbors and plenty of lengthy garden hoses, all is well. What a blessing! My last random note... I'm 33 weeks pregnant people. THIRTY-THREE. And at our appointment on Monday morning, my Perinatologist wrote orders for an induction at 39 weeks. That means, if my math is correct, we're talking SIX WEEKS until baby boy's arrival. SIX WEEKS!!! As in the last week of April, which is NEXT MONTH! Can you tell I'm in a slight state of shock & awe?? There is SO. MUCH. TO. BE. DONE. between now and then! I'm happy we're knocking out LO's room this weekend, because that means we'll FINALLY have her furniture to put together in the baby's room to set up his nursery. I'm not painting his room or doing anything drastic, so getting the nursery ready should be relatively painless. But I have yet to wash the first thing for him, haven't even gathered up Chase's old baby stuff that we'll plan to use, don't have any of the big stuff (like the car seat, stroller, etc.) pulled out of the attic yet, haven't even located some things like the baby bath tub or bouncy seat, and I'm not even sure if we have all the pieces of the Pack n' Play to put it together in our room for the first little while when he'll stay in our room with us. And don't even ask about hospital bags because I haven't even so much as started the list of what I'll need/want to bring, much less started packing any of it! I still can't believe the count down is just under SIX WEEKS for sweet boy's arrival. This is insane. I haven't even set up my time off from work yet or submitted paperwork for my leave. Geez. There's gonna be a LOT to get done over the next few weeks around here!!! But at least I got a great deal on a new breast pump though, right?? ((sigh)) Whatever it takes to distract myself from the fact that I'm going to be pushing a person out of me in the very near future... YIKES! Oh, and has anyone told you that Easter is only a week and a half away?? I've got to find the kids' Easter baskets and figure out what in the world I'm gonna put in them this year. Oh, and I'm also planning to MAKE (as in SEW) LO's Easter dress this year. Guess that'll have to happen next week, huh? Whoa!